I’d like to express a few thoughts on this subject as it has come up many times in the past (at least indirectly) and many times just after some type of catastrophic engine failure that some unfortunate boater has experienced. Most of these ideas have already been posted in one form or another on Boatdiesel (a healthy discussion in a CAT thread a couple years back or from some of my other past postings), but still they need re-emphasizing. I’ll try to summarize a few points that I feel are the largest contributors to long, or short, engine life, while also adding a few more perspectives on this important subject. And, since this forum’s main focus is on smaller high output diesel engines that are between 4 and 15 liters of displacement developing 50 HP-60 HP per liter and up, let’s keep that in mind when reading or interpreting the following ideas and thoughts. I’d also like to go back a ways and be sure that our readers understand that most of my background has been heavily influenced by working with post 1985 Cummins engine products and some of their engineering and application principles. But also, as horizons broadened, I developed what I think are general application guidelines and ideas that apply to any modern diesel used in marine service. Using these guidelines and ideas, I’m confident that these principles apply in any marine application. When discussing engine life, I think… no, I KNOW, that the most significant part of the entire equation of vessel/diesel engine operation leading to long engine life starts with the way an engine is propped (loaded) during normal vessel operation (not during a boat sale “sea trial”). This is number one, but add to this that the average diesel boat operator or new boat buyer does not have a true understanding of the (his) application and engine loading in relationship to the engine that is installed in the boat… this is now the formula for premature engine failure. This is not because the vessel operator is “dumb,” he just has not been properly educated this way. Do you think the boat broker told the prospective purchaser during a sea trial that he’d need to prop down 3″ of pitch after he filled the fresh water and bait tanks, and the boat would lose 4 K’s off the cruise speed, or his engines would be operating in a serious overloaded condition if no steps are taken to have the prop “adjusted”? Now add to this that the engine manufacturer, as the provider of operational guidance for these high output marine engines, has not done a thorough job in explaining the proper operation of these engines. You have a variety of terms used to describe the output ratings of these engines (“high output or HO”,–“A, B, C, D, E”,– “M-1 M-2, M-3,M-4, M-5” — etc, etc., and you have words like “continuous” vs “continuous” being used with complete opposite meanings (depending on the manufacturer). How could a vessel owner, who is relatively new to diesel engine operation, have a clue as to what all this means…Many engine distributors provide customer briefings, sometimes AKA “Captain’s Briefings,” that are supposed to “train” the vessel owner in the basic operation and maintenance of the engine. In fact, in my opinion, this is only a guise as the real point behind this is actually a way to get the owner to employ the services of the company for maintenance services after the briefing. What this type of briefing should be doing is explaining “duty cycle” based upon a daily operational basis, and explain, with better wording, that engine overload is a “fine line” that needs to be accounted for in the variables of engine operation when running right on the maximum recommended “cruise” RPM. I think that they should also use the term “prudent operation” when a pleasure boat engine is operating for extended times at maximum cruise ratings, regardless of term used to describe this type of operation. I know that ALL manufacturers of engines with these types of ratings per liter of displacement, should limit “maximum cruise” to a specific time per day and have a caution or “yellow” zone as part of the operation on the engine at these “maximum cruise” levels. They should have printed operation guidelines that stress proper “cruise operation” and stress the importance of adding weight to a planing vessel after the purchase, and how this interacts with the overall performance and ultimately, engine life. There is much more to vessel operation than “daily checks,” “required maintenance”, and “warm-up”, that seems to take up most O&M book guidelines and new vessel owner briefings. I sometimes wonder if the way “cruising” is explained or defined, it leaves the new vessel operator with thinking that “cruising” is the same as a trip down the interstate for 600 miles a day at 70MPH. Proper propping of a vessel cannot be stressed enough, will typically only come some time after the vessel has settled in to “its” normal running conditions, and then only with an understanding by the vessel operator of the engine’s operating requirements published by the engine manufacturer. But in addition to that, is the understanding that adding some conservatism, “PRUDENT OPERATION”, to these operating conditions by not running “on the edge” of these requirements, can mean the difference between 500 hours between catastrophic failures, and 5000 hours of relatively glitch free operation for the same engine. The easiest and most proven way to accomplish this “conservatism” is by propping the vessel at full working weight to rated RPM plus 100 to 200 rpm** when using these types of diesels that develop upwards of 50-60 HP per liter. It’s actually very simple when you understand the whole picture of vessel operation and all of the variables that occur on the ocean over time. New repower about 5 years ago with a custom 31 ft planing hull.. Boat propped at rated + 125 RPM and after a couple of months of adding “gingerbread”, it settled in at rated + 100 RPM. About 3 years went by ( 900 hrs of trouble free operation). Boat sold and the new owner added not less than 1500 lbs of addition hardware within weeks of purchase. He also had NO Idea of the operational characteristics of the engine. He just “drove” it at whatever speed he thought the boat wanted to go. Added about 75 hours to the clock over the next year. Sold the boat to a new operator, and this operator also had zero experience or knowledge as to the parameters that the engine needed to operate under. This operator added more equipment and a bow thruster, changed the muffler to a highly restrictive type, and by now, the engine would only reach about 400 under rated under the best of conditions. Where/what was this vessel run at? Between 0 and 50 RPM “off the top” which was now over-propped to 400 RPM less than rated. Result: Total melt down of #4 and a cracked block at about 1100 total hours. And, what really gets me, is the guy’s son is a boat broker and licensed Capt that used the boat extensively, and should have known better. He supposedly “knows” proper vessel/engine operation. So typical, but this is all after the facts were known. Moral of the story is: propping for the best engine life can only be done with proper education of vessel/engine operation. Using the rated RPM ++ under fully laden conditions will help assure that this type of failure will not be something to worry about. Concerning this propping issue, let me add this to the subject. Using “EXACT MATH” to figure the correct prop size, does not apply, and even further, will never apply, and at best, will only guide the boat owner, builder, or architect, etc, to a reasonable starting point in his endeavors to get the best performance vs a combination of engine life and all of the other variables that affect vessel operation. The problem is though, with this approach, it seems “best performance” is given the lion’s share of this part of correct vessel propping as “speed sells”. Over the past 20+ years and having the opportunity to formally sea trial well over 200 vessels, I have been able to build a good database of engine performance/engine loading vs prop size. Comparing top speed vs cruising speed, planing vs “something else”, and the big one, “Overall ENGINE Life” vs “all of the above” mixed in with another 10 or so variables, there is no doubt how engine loading is directly related to engine life. The “EXACT MATH” that typically comes from prop calculators, graphs, architects, builders, etc. when figuring a prop size is much more likely to lead to “running on the edge” or worse, than yielding the correct prop size to insure good engine life in relation to performance. Nothing can replace “on board” engine monitoring and the understanding of (all) engine operational parameters during normal operation…nothing. 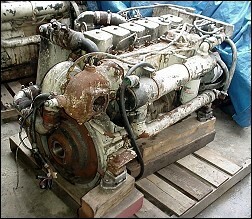 Only with the proper education of the boat brokers, builders and vessel operators, along with a change in the way manufacturers provide operation and maintenance guidelines will we ever see positive improvements in the continuing cycle of well designed engines, with relatively low hours, having catastrophic failures within the first 2-6 years of new vessel operation. Add to this, that many newer vessels change ownership at 100-150 hour intervals during the first 300-600 hours/ 2-5 years of engine use, and this cycle is only amplified. I hope the above will offer a partial solution and incite needed to how important proper engine loading is, and understanding that the starting point to proper engine loading is the propeller. Hopefully, this will lead to fewer postings asking help due to these types of failures directly related to the over propping your vessel.